We are proud to be one of the most recognized commercial landscape companies in New Hampshire. You’ll see our Cameron’s trucks and equipment at job sites around New Hampshire, Maine, and Massachusetts. 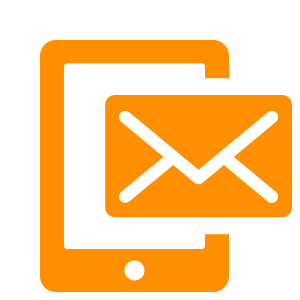 Our trucks have been their iconic Orange color for as long as we’ve been in business. Hard work, extensive knowledge, experience, and commitment to value have made us the landscape contractor of choice for many commercial development projects. We continue to educate our staff to new technology and methods that meet or exceed industry standards. Cameron’s has worked with the New England Patriots for decades, beginning in the 1980’s with landscape renovations at Sullivan Stadium in Foxboro, MA. 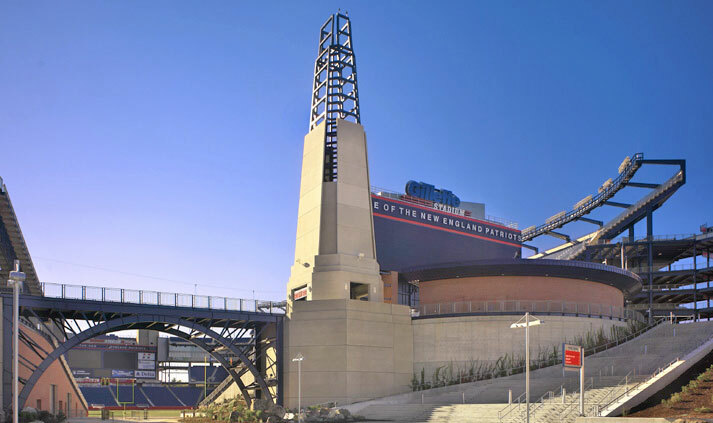 We were fortunate to be selected by the Kraft family to be the landscape contractor for the construction of Gillette Stadium in 2001 and 2002. Our crews, led by owner and Patriots fan, Scott Cameron, worked for 8 ½ months over two summers on this large-scale landscape construction project to make sure that the stadium looked perfect for the season opener of the Super Bowl Champion New England Patriots in September of 2002. During the first year of the project, extensive site work was accomplished. Our crews focused primarily on the daylighting (restoring to a more natural state) of the Neponset River, which had been buried in culverts under the racetrack at the Foxborough location. As part of this award winning project, we established erosion control through wetland seed and coir matting to stabilize the banks and established vegetation with native trees and shrubs such as blueberry, chokeberry, willow, maple, and pine. This environmental restoration was featured in Landscape Architecture Magazine in April 2003 designed by Haley & Aldrich. 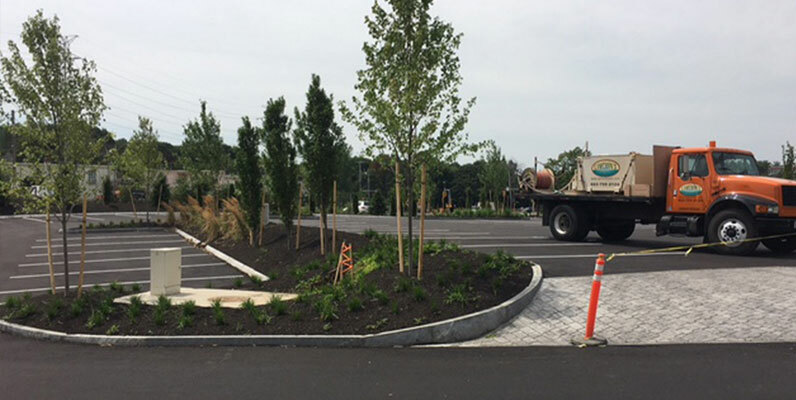 During the second year of the project, just months after the Pats won Super Bowl XXXVI, we returned to Foxborough to complete landscape construction of the stadium and parking areas. Our crews planted over 800 trees and laid 7 acres of sod around the stadium. Native plants and shrubs were planted throughout. In Gillette Stadium’s “Seascape” area, at the foot of the iconic lighthouse behind the end zone, we planted ivy, ornamental grasses, and blueberry. Large scrub pines were planted in the area by being lowered from a crane in the stands above. 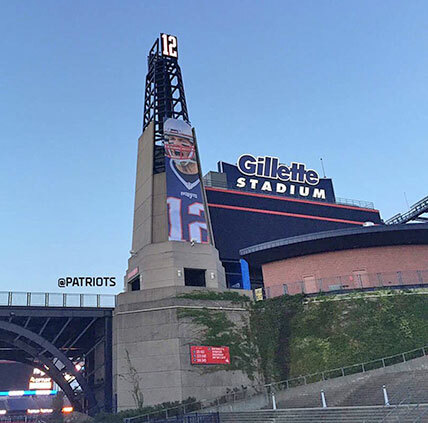 We are proud of our work for the Kraft family and our relationship with the New England Patriots. Each year we enjoy returning during football season to see how the landscape has matured. Special thanks to site supervisors Dan Krantz and Mark Negrotti for their partnership during this rewarding project. Cameron’s sells and delivers sod to all of New Hampshire, Massachusetts, and Southern Maine. Sod can also be installed by our professional crews on any size job. If you place an order ahead, you can also pick up sod at our facility on Route 11 in Farmington. 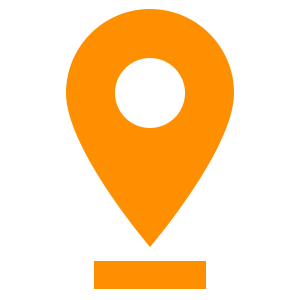 Pricing is per square foot and is determined by pick up or delivery, location, the size of the area, and installation costs. 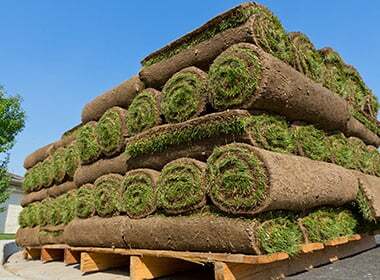 A typical roll of sod is 2’wide X 5’long, totaling 10 square feet per roll. Sod, weighs on average, 2500 pounds per 500 square feet. Cameron’s Home & Garden Center is proud to be one of the most recognized commercial landscape contractors in New England. 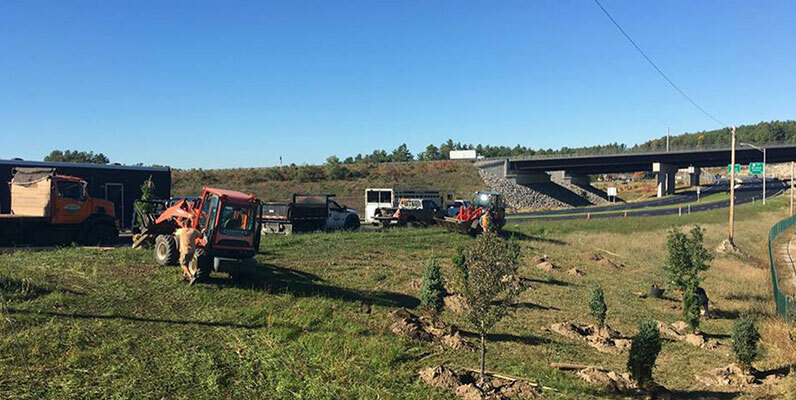 You’ll see our trucks and equipment at job sites around New Hampshire and the region. 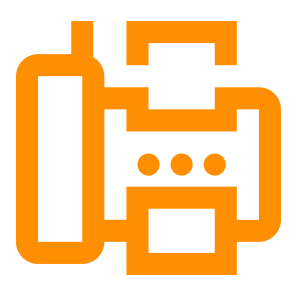 Our trucks have been their iconic orange color for as long as we’ve been in business. Entrust your commercial landscaping needs to us. To schedule an appointment, call or email us today.